Recalls of Tylenol, Motrin and Benadryl might have received the most attention, but they were just part of the story as recalls of over-the-counter (OTC) and prescription drugs quadrupled in 2009, and are on track to hit alarming heights in 2010. The Food and Drug Administration (FDA) reported more than 1,742 drug recalls last year, exploding from the 426 reported in 2008, according to a CNNMoney.com report citing the Gold Sheet, an industry publication that analyzes FDA data. Although drug repackager Advantage Dose accounted for more than 1,000 of the recalls in 2009, recalls still leapt by 50%, even when excluding that now-defunct company. "We've seen a trend where the last four years are among the top five for the most number of drug recalls since we began tallying recalls in 1988," Bowman Cox, managing editor of the Gold Sheet, told CNN. "That's a meaningful development." The alarming rate of recalls shows little sign of slowing down, and already totaled 296 by the end of June this year. "If we continue at this same rate, we could get 600 or more recalls by the end of the year," said Cox. "That's still a very high rate of recalls." 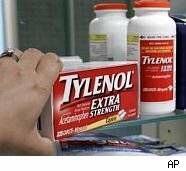 High-profile recalls of Tylenol and other products by McNeil Consumer Healthcare, a unit of Johnson & Johnson, have drawn attention to quality concerns in manufacturing. A recent FDA investigation of a McNeil Consumer Healthcare plant turned up a number of quality control problems, including a failure to check products for bacteria, to properly test batches, and to safely store materials and labels. An FDA official told the Gold Sheet that 2009 actually witnessed no increase in recall "incidents" -- or recalls involving one product problem at a company -- just more recalls per incident. "Since every recall situation is unique, it would be difficult to assess whether there are any trends or increases in recalls this year," FDA spokeswoman Elaine Gansz Bobo said in the report. "At this time, however, we have not identified any trends." The rush by pharmaceutical companies to introduce generic versions of popular drugs is also cited as a reason fueling the recall spike. Industry group PhRMA says generic drugs account for about three-quarters of all prescription drug sales. "The first applicant typically gets the lion's share of the business for the new drug," said Cox. Repackagers, who relabel drugs into smaller units for resale or distribution to health care facilities, were also responsible for hundreds of recalls. Advantage Dose was the chief culprit, and issued 1,106 recalls last year following the FDA's inspection of its facility in late 2008. According to the Gold Sheet report, the FDA's inspection results listed a wide range of manufacturing problems. Intense competition is also blamed for the staggering number of recalls in recent years, with pharmaceutical companies cutting costs by outsourcing production to other countries. The Gold Sheet report said that 165 recalls last year were of products made -- or believed to be made – overseas, a 58% increase from 2008.